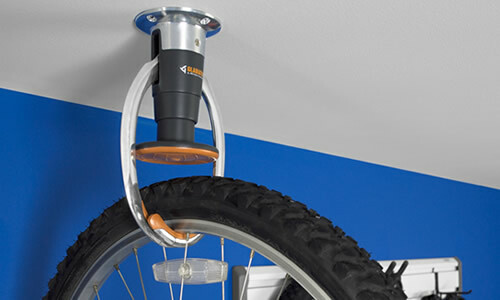 Gladiator Claw Makes Bike Storage Easier Than Ever | OhGizmo! Have you ever tried hanging a bike on a ceiling hook in your garage? Well that’s where my parents kept our bikes in the winter, and let me tell you, they were a pain to use. It seemed like you couldn’t ever get the wheel up and over the the hook. Or sometimes one of the spokes would catch, and that would be even more fun to deal with. Well if you like to store your bikes like this, but want to get rid of some of the hassle, you might check out the Gladiator Claw. This cool little device has a giant button that you press with the tire of the bike. When this is done, two metal hooks come down and grasp the tire. When you’re ready to take it down again, just push up on the bike so the tire hits the button, and the hooks open up again. No muss, no fuss. Is the convenience worth $60? I guess it depends on how often you have to hang up your bike. jesus, people cant handle hanging up a bike?